Don't hesitate any longer! This is a must buy for anyone that wants accurate time zones and sunsets or sunrises. 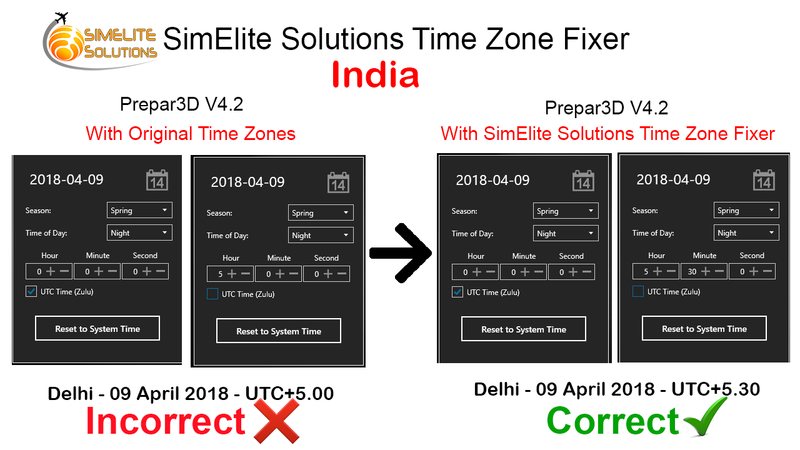 I have completed many flights over the past several days after purchasing Time Zone Fixer for P34, the sunsets have occurred at the exact same time and location as the real world sunrises the same. If I depart say Colombo Sri Lanka which has a 30 minutes difference in time my destination for example Doha will be the exact time it is in Doha not staying at the 30 minutes difference if I was using the standard time that comes with P3D. 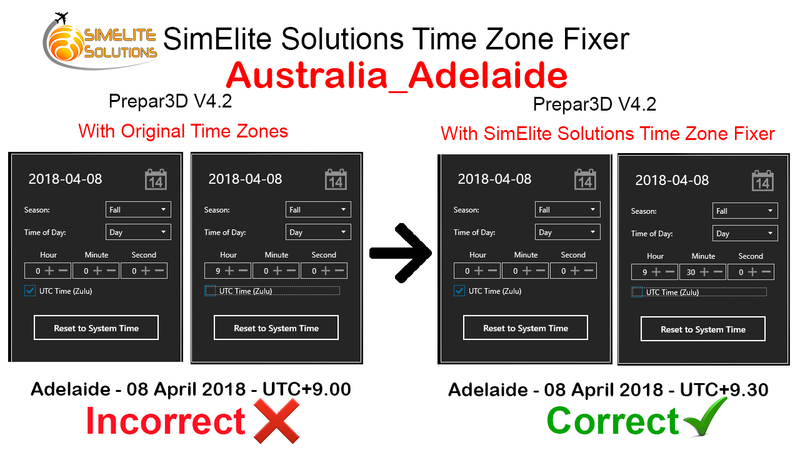 Time Zone Fixer is well worth the five stars and more! must have!!! It solved all my problems about times, sunrise ecc… it's a very strange sensation to install simply an add-on and that's all... it works! Excellent bit of software. I've yet to find any time zones that do not match real world local time. Makes flying in P3D4 so much more realistic now that we can follow proper schedules and get the correct sunrises/sunsets. This is an essential fix for your flight sim - buy it. 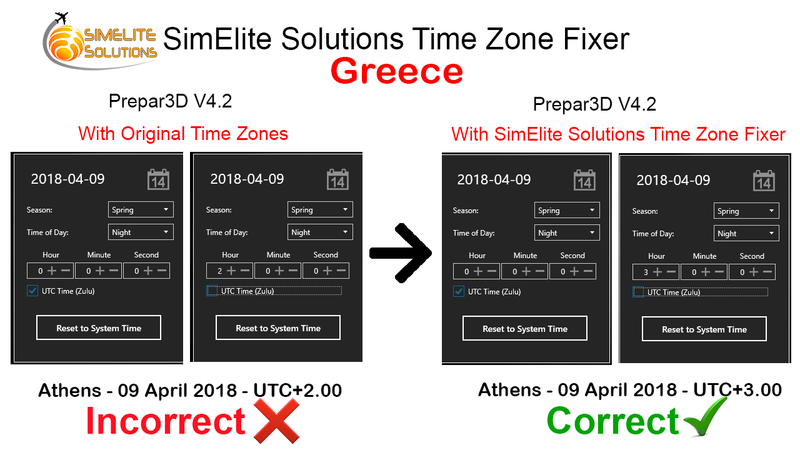 This is exactly what I was looking for to fix the problems P3Dv4 had with time zone offsets in Alaska and Hawaii. When I complain to LM they said sorry, but they used the standard 15 deg per hour offset for places that were not heavily populated (like no one every goes to Hawaii, right?). This fixes that and of course globally, and nothing else so no stuff running in the background messing with the simulator clock function. This is just bgl files that fix the problem, and they issue updates as required. Simple and effective. Great Product! I was getting quite upset of not getting the right times at different places. 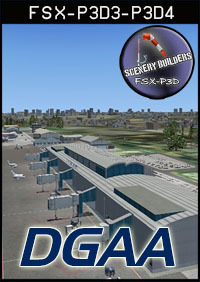 A must add-on for those who want to get the experience as real as it gets... but it's a complete shame that we have to keep on getting add-ons to get P3D/FSX work properly. I never really knew I actually needed this, until I purchased it. After using it for the few days, I noticed a difference in times zones, proper sunrise & sunset times etc. If you are a long haul pilot like me, who likes to trek across multiple time zones in a single flight, this is definitely for you! Or, if you are just looking for the proper times in your area, this will absolutely fix the issue. Comes with regular updates. It's a simple install with a "check.exe' to verify it's been applied properly. Documentation is top notch. Can't beat the price, either. I highly recommend this product. Very simple and it works!!! After all these years, I finally get to fly with the correct sunrise/sunset in southwestern Colombia (my home area)... All the recent world time zone changes have been applied/updated on a weekly basis. This product is a "must buy" A big thank you to the developers!!! 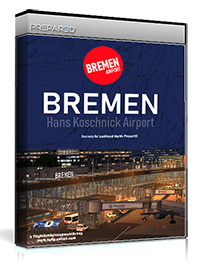 Excellent programme!I've waiting ages for something like this.At least, i can fly with the correct sunrise-dusk at my P3d.Thank you!Must buy! 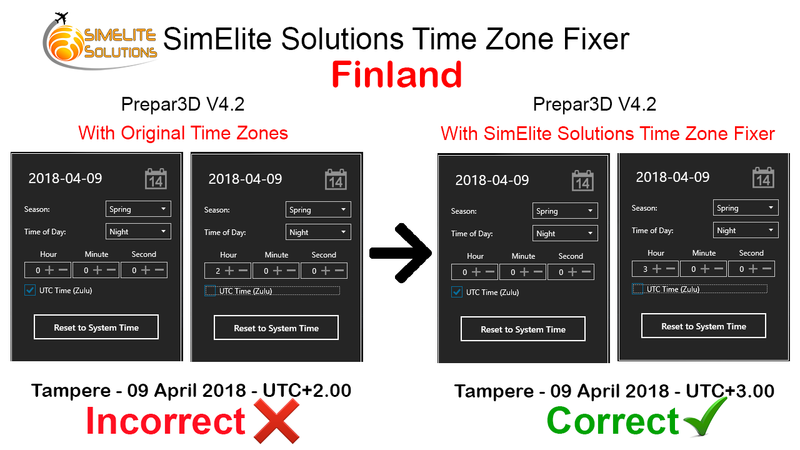 Easy installation with bgl files activated like scenery addon, corrects time issues at all my airports and thus corrects sunrise and sunset issues I had with Iceland airports.  Regular updates are needed to keep track of day shifts and are also provided as download from the developer site. Well worth to add it to your sim world. Don't hesitate any longer! This is a must buy for anyone that wants accurate time zones and sunsets or sunrises. 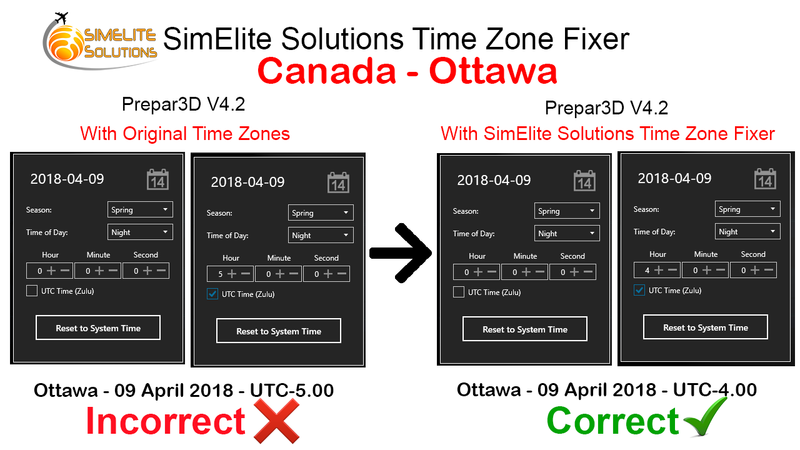 I have completed many flights over the past several days after purchasing Time Zone Fixer for P34, the sunsets have occurred at the exact same time and location as the real world sunrises the same. If I depart say Colombo Sri Lanka which has a 30 minutes difference in time my destination for example Doha will be the exact time it is in Doha not staying at the 30 minutes difference if I was using the standard time that comes with P3D. 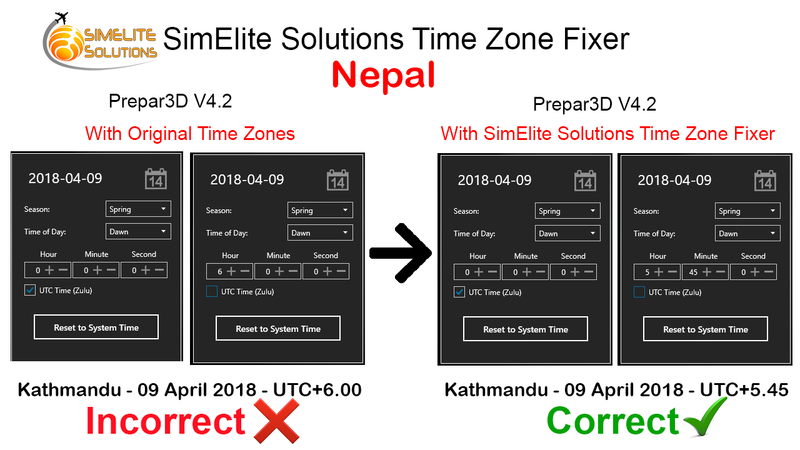 Time Zone Fixer is well worth the five stars and more! s. This is an essential fix for your flight sim - buy it.